*Chain 3, 2 double crochet (DC) in the center of ring, chain 2, slip stitch to center. Repeat * 2 more times so you have 3 leaves on your shamrock. Hold the working yarn and tail together and chain 4-6 stitches to make the stem, snip yarn and secure. Now use a safety pin to attach this to your shirt! Happy St. Paddy’s day and til next time happy crafting! A St. Patty’s Day Free Craft & $1 Retirement Sale! The most fun thing about this project is the Magic Rainbow Paintbrush and you can make it your self. Just take a 1″ foam paintbrush (they are on sale for 5 cents each at ACmoore this week!) and squeeze yellow paint on the cent and red and blue at the sides as shown. This needs to be tube watercolor, gouache, or tempera paint, I tried liquid watercolor and it was a mess, the colors blended together too much. Now spritz the brush with water. Then you want to work the paint into the brush by painting the brush back and forth on a palette, don’t flip the brush, keep the color lined up. 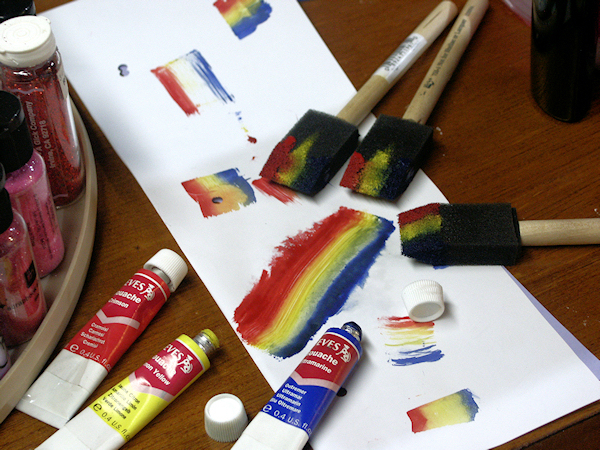 Now you should be able to make a lot of rainbows, just give the brush a spritz of water when it dries out. You can let the paint dry up in the brush and spritz it with water when you are ready to use it again! You can make these in other colors too, oh the possibilities! You can download the instructions and template for free here. They are in PDF format so no need to worry about sizing. Since you are going to my shop anyway please check out my retiring products on sale for $1! The sale ends on Wednesday the 22nd so Don’t Wait! Phew, that’s a lot of $1 steals! Don’t wait tho, they are only availble at MyGrafico until Wednesday during the Semi Annual Retirement sale! Thanks for stopping b nd til next time happy crafting!